A lovely traditional style building just outside of Chiang Mai. A tuk tuk or taxi can easily be arranged for you for 200 bhat . We were a little concerned on arrival that there is little around the hotel to visit but once we were behind the big wooden gates it didn't matter as we had no desire to go anywhere . 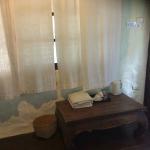 Our room was in a 100 year old part of the building and was full of wood panelling and shutters to keep out the heat . The whole atmosphere at Tonnam is relaxed and friendly . If you want to help in the kitchen and learn how to cook Thai food this is welcomed and Pom the head chef will keep you totally entertained. We enjoyed local cycling and canoeing trips with Yule the owner of the hotel and enjoyed evening meals around a large table with the other guests who are now friends . The pool is a beautiful respite from the heat and so clean . Great pride is taken with every aspect of caring for the guests here . We hope to welcome you again! We had a wonderful time in Chiang Mai thanks to Yul and his staff. 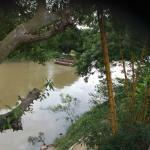 The place is very nice furnished, has a stunning view on the river and a cute pool are. Yul was a perfect host and helped us arranging everything we wished for. 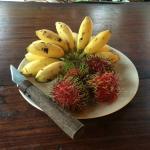 Our highlight was the cooking class with pom - the chef of the homestay. The food was delicious and we loved eating everything. We really had an amazing time and we recommend this place to every one! Thank you Nadine for this excellent review. We are delighted you liked our place! Thank you so much Jennifer for your wonderful review. It is heart warming for us when customers/friends! enjoyed their stay at our place! We hope to see you all again! Authentic, Simple and truely from the heart. 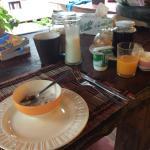 I stayed at Tonnam for my first few nights in Thailand and I am very pleased with the time I spent here. The service was personal and warm. Yul was a great host and we shared a lovely conversation with an unexpectedly appropriate message for me at this time in my life, GO FOR IT. And it payed off, I ended up getting what I wanted! As you can see this is not your standard B & B, you don't often come away from somewhere you stayed saying this kind of thing! Are simple, comfortable, peaceful and have everything you need. Is great but a little expensive, having said that it is cooked in front of you and Yul and the ladies in the kitchen will even teach you how to make it. The only drawback is that it is well outside of town, unless you are a family it is isn't very convenient on a budget- as it is 200 bhat each way every time you want to go into town and when you add this to the cost of the room (which has no television and wifi does not extend to every room) it's definitely more expensive then other places in town in terms of location and facilities. BUT it is unique and I highly recommend it, its is charming and the hosts make it all worth while. Hello! Thank you for your detailed and very original review. Glad you enjoyed the spiritual advice! We stayed here for 2 nights after a jungle/elephant trekking overnight trip. It was such a relief to arrive at Tonnam and have Yul as a resource to ask questions and arrange things for us. Someone was available to pick us up and bring us to the resort and take us into town whenever we wanted for a reasonable price. In fact, all goods and services provided at Tonnam were at a very reasonable price and not inflated like other places. Next he arranged for us to have massages at the home stay within 20 minutes of asking. What really made our experience though was our last night the fondue dinner arranged for us and the other 2 families staying. We are family style and it was a real treat and we could tell took considerable planning and effort. Bravo! Thank you April for this review that really touched our heart. I'm glad you noted we don't over charged, Honesty is one of our rock value!! Hope we'll have the pleasure to meet you again! 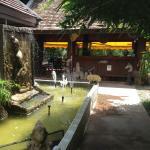 A peaceful beautiful oasis of an inn on the banks of the river just outside the main central area of Chaing Mai. 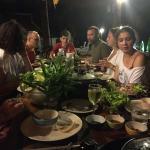 A highlight of our trip to Thailand, Tonnam Inn was the perfect place to unwind. 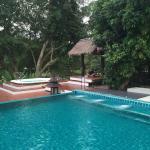 Great little Thai styled cottages surrounding a wonderful infinity pool, and outdoor eating area. The food here is incredible and Yul is a wonderful chef, cooking up great Thai dishes and offering cooking classes to guests. Well worth it, we came home with some new Thai cooking skills. One of the highlights was a tour of the local food market with Yul where every fruit and vegetable, fish and meat you could ever dream of was sold. I highly recommend this place.